Drugs can be broadly defined as substances that change the way the brain and body function. One of the key messages that the students learn during this module is that some drugs are legal, while others are not. Legal drugs include medications when they are prescribed to you by a medical professional, caffeine, nicotine, and alcohol. Even though legal for adults, tobacco (which contains nicotine) and alcohol are illegal for children. Drugs that are illegal for everyone, all the time, include marijuana and cocaine. As this list shows, legal drugs can be helpful, but certain legal drugs, such as alcohol, can cause tremendous damage. All drugs can affect the brain and body, and children should only take medications that are given to them by a trusted adult. During the second part of the activity, the students will look in magazines, newspapers, on the Internet, and in movies to find out how illegal and legal drugs are presented in our society. They will discover that often drugs are shown as being enticing and appealing. Both men and women shown using drugs are, in many cases, attractive, well dressed, and seem to be having a great time. The fact that drugs are paired with such positive qualities sends a confusing message to kids. 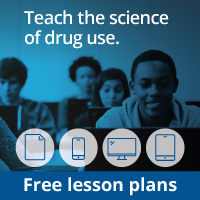 Once the students learn how drugs are presented in the media, they will have a better understanding of why drugs are such a serious problem in our society. This activity will lay the foundation for the remaining activities in the program, which focus on how drugs affect the brain and the nervous system. By the end of the program, the students will have a better idea of why people are tempted to try drugs, but they will also know why—based on scientific fact—it is so important to resist that temptation.